Comic-Con: "No Lanterns. 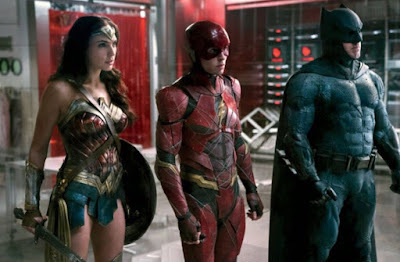 No Kryptonian"- Watch The New 'Justice League' Trailer Now! I say this every year, but I don't know how Marvel is going to top Warner Bros.' presentation here at Comic-Con. Simply awesome. And what put it over the top was the latest trailer for Justice League, which has some amazing new footage and reveals I wasn't expecting. In it, we finally get a look at the villain Steppenwolf, who has the sheer audacity to set foot on the island of Thymiscira, the home of Wonder Woman and the Amazons. But what's most interesting is what he, or presumably him, says..."No protectors. No Lanterns. No Kryptonian. This world will fall, just like the others." It's basically our first legit reference to the existence of the Green Lantern Corps in the DCEU. I'm stoked. Are you? Watch the trailer and you will be. Call me crazy but I got hyped just seeing Jeremy Irons as Alfred again.